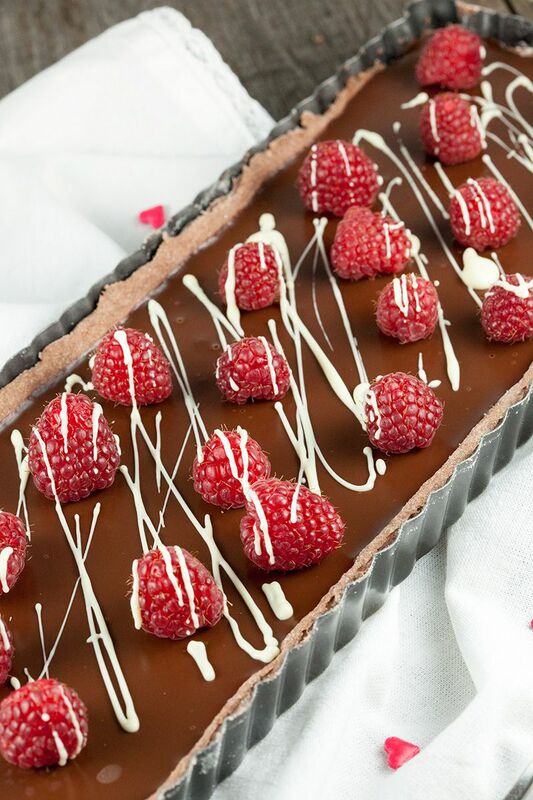 Valentine's day is coming up, so what's better than an amazing chocolate tart with raspberries. Mmmm, chocolate, so delicious! MIX 250 gram all-purpose flour with a pinch of salt, cocoa powder and 80 gram sugar. CUT the butter into small cubes and ADD those one at a time to the flour mixture. Keep on mixing with the flat beater attachment. The mixture will look crumbled. ADD 1 egg yolk and 2 tablespoons of cold water. Keep on mixing until a dough ball has formed. WRAP the dough in cling film and let it rest in the refrigerator for about 1 hour. PRE-HEAT the oven to 180 degrees celsius or 350 degrees fahrenheit. GREASE a rectangular tart pan with butter. ADD a little bit of flour to the countertop and use a rolling-pin to roll out the dough. PRESS the dough into the pie form and poke holes in the bottom using a fork. Use your rolling-pin to trim the overlapping dough. PLACE a piece of parchment paper onto the bottom of the pie crust. ADD blind baking beans to the pie crust and bake in the oven for about 10 minutes. For the chocolate filling, slowly heat the cream in the small saucepan. CHOP the dark chocolate into smaller pieces and when the cream is hot enough, add the chopped chocolate and whisk until it’s a smooth mixture. CUT the butter into cubes and add the butter little by little and keep on mixing until the mixture is smooth again. Turn off the heat and let it steep until the mixture is cooled off a bit. Then POUR the chocolate mixture into the baked pie crust. 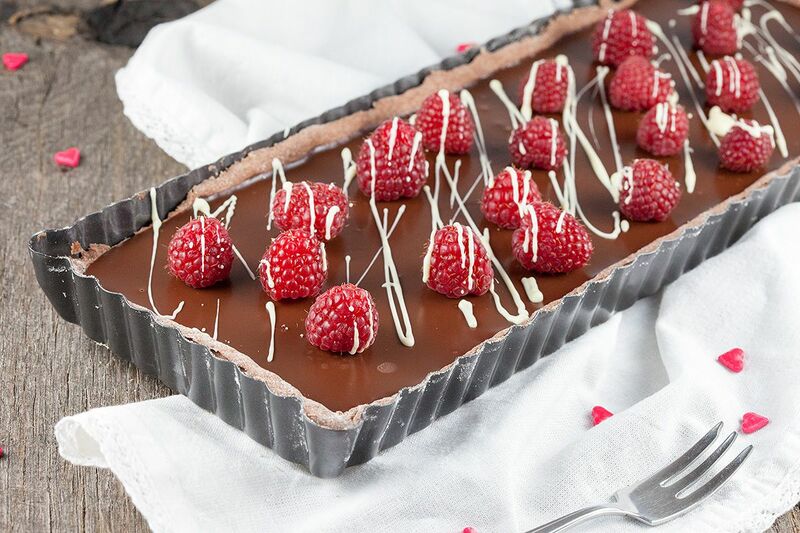 Refrigerate the tart until it’s cooled off completely. Finish the tart by dividing the raspberries. Create a bain marie by adding a layer of water in the medium-sized pan and bring to a boil. Make sure the water doesn’t touch the bowl, the steam will slowly melt the chocolate. Chop the white chocolate and ADD the chopped white chocolate into the bowl and place on top of the pan. 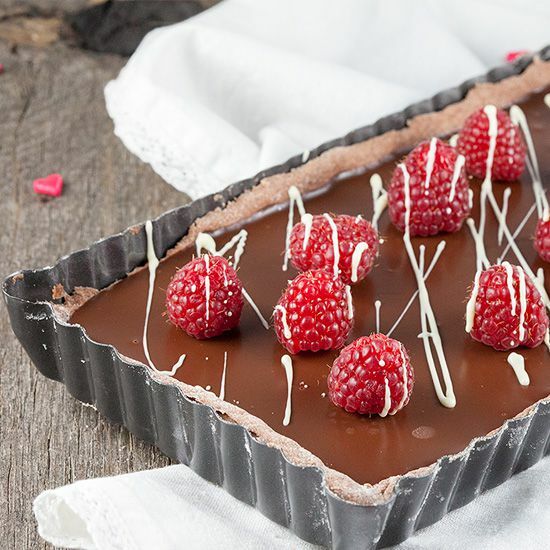 If the chocolate is totally melted, DRIZZLE the chocolate over the tart and create a pattern you’ll like. Enjoy!